The Horseradish plant, scientific name Armoracia rusticana, syn. Cochlearia armoracia, belongs to the Brassicaceae family and is a perennial plant. It is therefore closely related to broccoli, wasabi, cabbage, and mustard plants. The plant is native to western Asia and to the southeastern Europe, but is commonly grown in almost all parts of the world today. Horseradish is used for its strong hot flavor and has many nutritional and health benefits. It is highly rich in potassium, magnesium, vitamin C, and calcium. Its roots are normally grated, chopped, minced and mixed with vinegar. It can be served with various kinds of fish and meat dishes, especially roast beef. There are two common varieties of Horseradish: Maliner Kren and New Bohemia. Horseradish can grow up to five feet tall (1.5 meters) tall, and is usually cultivated for its large pungent white and tapered roots. Container Grown Horseradish photograph by Jerry Pank. Although Horseradish is a perennial plant it can also be cultivated as an annual as roots often become fibrous and tough during the second year. Many gardeners prefer growing this plant in containers as they can grow out of control easily and will spread readily when planted in garden beds. Due to its root system, new plants will continue to emerge even though plants have been dug out to harvest its roots every year. This is the reason why most people prefer growing Horseradish in pots; to keep it restrained. 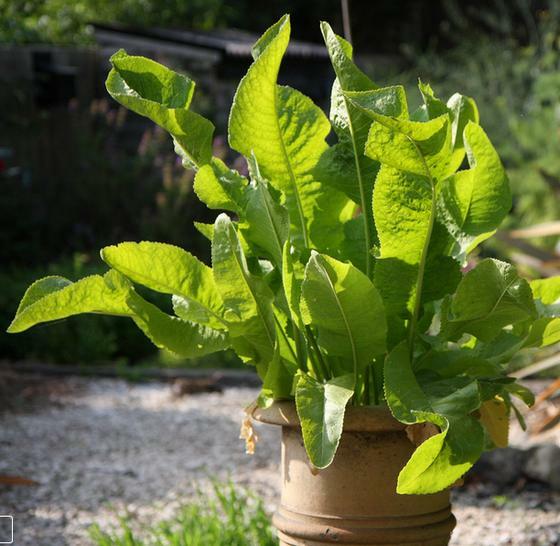 Horseradish plants are best grown in full sunlight, though they can tolerate partial shade. Choose a location that has a well-drained soil, with a pH of 5.5 to 6.8. Add compost and sand to the planting bed to keep the soil loose. The soil should be prepared to a depth of 10 to 12 inches (25–30 cm) and any lumps and stones removed to prevent the roots from splitting. If the soil that the Horseradish are growing in is not rich, then add organic compost two to three weeks in advance. 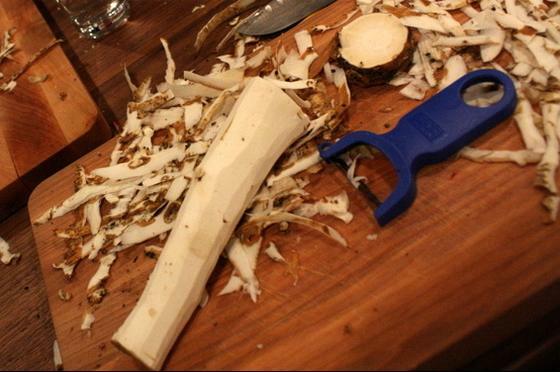 Preparing Horseradish roots by Leslie Seaton. The plant grows as perennial in zones two to nine. It is usually grown from root cuttings or crowns. When planting Horseradish, the temperature should be around 45 to 75°F (7–24°C) as it is a cold-hardy plant. Conduct root cuttings or set out crowns four to six weeks prior to the average last frost date. Set the crowns at soil level and plant roots three to four inches deep in shallow trenches, with two to three inches of soil. Space roots 24 to 36 inches (60–90 cm) apart. When planted directly outdoors, there should be metal, masonry borders, or wood set at least 24 inches deep (60 cm) around the bed to prevent spread. Horseradish is best planted in a deep container, such as a whiskey barrel planter, treat soil as described above and maintain soil pH at 5.5 to 6.8. Plants in containers can grow to around 24 inches (60 cm) tall and 18 inches (45 cm) wide. Always keep the soil evenly moist as this will prevent roots from turning woody and become dry. 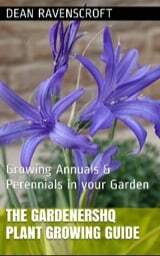 Be aware that over-watering will lead to very strongly flavoured plants with soft roots. Adding organic compost once a month will supply the plant much-needed nutrients. Alternatively add one teaspoon of nitrogen fertilizer to each plant at four and eight weeks after planting. To produce larger taproots, slice down around the plant with the use of a spade at about three to four inches (7.5–10 cm) from the base to prune away lateral side roots. Some people also remove all but the topmost leaves to produce stronger horseradish roots. Do not leave root pieces in the ground after harvesting, as this will produce many unwanted plants the following year. Although some common insects can attack the plant, there are no serious pests and diseases that Horseradish plants. Carefully remove any damaged parts and pinch off insects that are seen on the plant. Hoe around young horseradish plants. Mature plants are not susceptible to weeds. Cut the sections of the root once leaves reach 12 inches (30 cm) long, and roots are three to four inches (8–10 cm) in diameter. Horseradish normally has peak growth in the late summer and fall/autumn so it will be ready to harvest during mid-autumn or later. New plants will spring the following year unless you harvest all of the roots before the ground starts to freeze. Grated Horseradish can be kept inside a glass jar and stored in the refrigerator for a week or two. As horseradish leaves contain volatile oils they should not be used to feed pets. Wikipedia; USU Extension; Herb Expert.